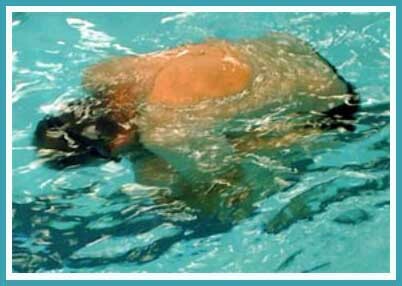 You can check your personal buoyancy with a simple test in the shallow end of the pool. You are going to have to put your face in the water, so if you have a problem with that, you should get yourself a good pair of goggles first. They don’t have to be very expensive, but an adjustable bridge and soft rubber seals make for a comfortable, waterproof fit. The simplest test is the “Hedgehog Float“. Because the legs are under the body, it is easy to stand up again afterwards. Take a deep breath and hold it. Put your face in the water and draw your knees up to your chest. Wrap your arms round your legs and hold the position for 5 – 10 seconds. You will be able to feel if any part of your body is above the surface of the water, in which case you are positively buoyant. If all of your body sinks below the surface, then you have neutral or negative buoyancy. Just to make sure, try again, taking the deepest breath you can manage. � Copyright Mike Kearney, 2008.